The Managing Director of Hovertravel has offered his sincere apologies to customers and reassures them that the company is focused on resolving the recent issues. Neil Chapman, the Managing Director for Hovertravel had issued a sincere apology to customers following several recent disruptions to the service. In an email to Hovertravel customers, Neil explains more about the issues they’ve had and how the company intends to mitigate any further disruption. 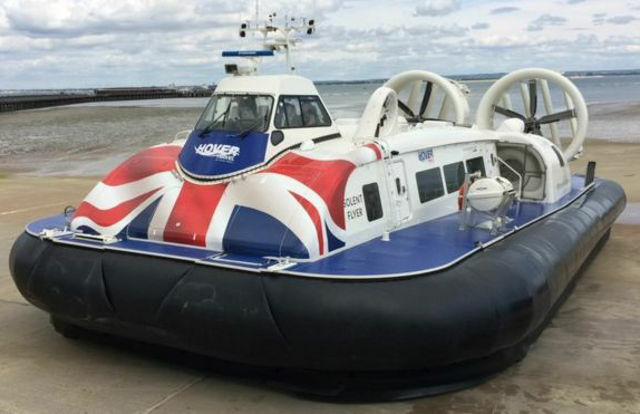 Over the past week, there have been engine issues on both the Island Flyer and the Solent Flyer – Hovertravel’s latest new craft that came into service less than two years ago. Hovertravel have always been very proactive in communicating with their customers, alerting them to difficulties and reacting to feedback. “As you can note most of the issues we experienced were related to the engines of the craft, something we had not experienced before. “That said, I appreciate after speaking to many of you wanted to understand what measures we have taken to improve the situation witnessed over last week with many observations, outside the technical issues. Engine support contract: We are meeting with the engine supplier, to ensure that their services meet the expectations of ourselves and our customers. Engineering: Working closely with other suppliers to ensure they provide the support needed. Service Status Information: To improve the consistency of the information provided, across all departments and electronic methods. Priority Line & Groups: When we have a one craft shuttle, ensuring the priority is as it’s intended. Compensation: Ensure the recently agreed compensation scheme ‘if you wait we will pay’ is applied consistently across all times and you receive these. Statistics: Produce and share reliability statistics, to give the overall reliability for the week & month, but also the ‘peak commuter’ periods. “In addition we have set up an Improving Reliability Plan, and the senior members of each team will be meeting every work day to review the performance of the services, understand any issues and implement any required corrective and preventative action immediately. “I had a number of you contact me as to not receiving the compensation vouchers, hence we will be issuing vouchers for Wed, Fri & Monday to you all who travelled on these days. These vouchers will be ready for collection from next Tuesday at Ryde from 1200 on production of your card. “Additionally to ensure full disclosure and improve consistency of communication, for the next few weeks we will be issuing a Hovertraveller Update every Thursday to keep you updated on our progress on the issues you have raised. “Clearly we have considerable work to return our reliability after this week but rest assured this will be undertaken by all the team and myself. I would though like to say how grateful I was for the many complements I received as to our staff. “Many of you asked for senior managers to be on duty, and further to this request a few months ago we have appointed three Duty Managers who all have the autonomy and support from myself to take the required decisions, and whilst I will always be available for you all – these DMs are appointed to assist you as required in the terminals.